Plot of distances covered since august, scale in km, from myasics. There are many theories about running. About where to run, how to run, what to wear, what to eat or drink. All kinds of things. And there many places for learning more about these things. 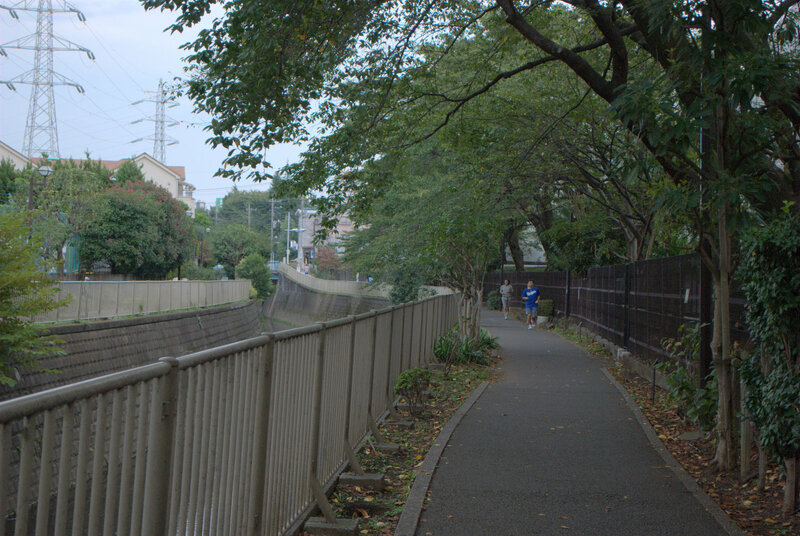 This is about where to run for long slow runs in Tokyo. For intervals, nice parks or tracks are better. For recovery or shorter runs to options are fewer. But with long runs the possibilities open up, as a non practising road cyclist this makes me happy. Tokyo is going through a running boom at moment and races sell out very quickly. 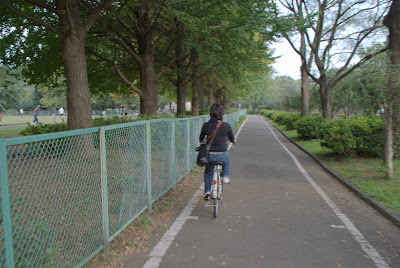 Since running is for distance is about distance it is possible to do it by running around in a park or the nice loop around the Imperial Palace. But since I don't live or work close it doesn't make sense. For the long slow run I propose the usage of paths following water. 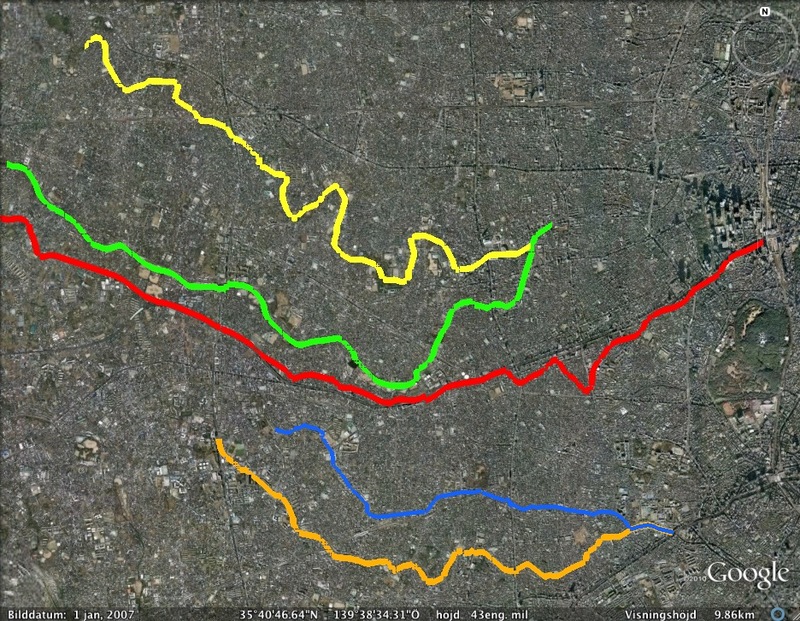 I has the following advantages: almost flat, linear, varying landscapes suchs as Danchi areas, houses, parks and so on. If you want to add hills you leave the path for while and come back. The following paths are mostly useful if you live between west of Yamanote-sen in the general areas they occupy. However, both to the north and to the south there are many different paths that can be used. They all are constructed somehow. More reading about some of these paths. I you like me don't like to run the same path in both directions these paths have possible connections such as Tamagawajosui to Inokashira-koen and Kandagawa back. The others are left as an exercise for the reader. Five linear paths I use for running. Screen shot from Google Earth, Google map here. The different lines show from north to south. Zenpukuji-gawa 10.4 km, 善福寺川, yellow. 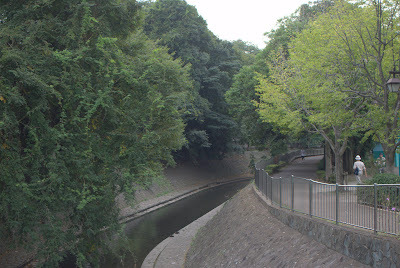 Flows from Zenpukuji-koen and joins Kandagawa in the west. A big park along it between Kanpachidori an Kannanadori. Kanda-gawa 10.8 km, 神田川, green. Starts from Inokashira-koen and after being joined with Zenpukuji and entering Nakano-ku changes character, here the trail on the map ends. Eventually ends up in the outer imperial moat at Iidabashi. Tamagawa-jousui 41.2 km, 玉川上水, red. From Tamagawa in the east to Shinjuku station. Not a river but at all, but a waterway built to supply Edo with water, work started in 1653. While it follows Chuo Expway and sometimes disappears underneath, is is not always that fun. Also nice because it is at the top of the topography, many nice views along the way. Mostly covered from when it joins the Chuo expressway and towards Shinjuku, but still very nice. An open stretch near Sasazuka and when it goes under Keio-main line close to Daitabashi-station. Kitazawa-gawa green road 7 km, 北沢川緑道, blue. Very good variety of scenery. A covered river road. Joins with Karusuyamagawa and becomes Meguro-gawa. Karasuyama-gawa green road 8.4 km, 烏山川緑道, orange. A covered river road. Joins with Kitazawagawa and becomes Meguro-gawa. Not fully mapped, continues on the other side of Kanpachidori. Before you follow any of them please check the maps carefully, it is mostly very easy to follow them but there are parts when you have to go around obstacles that aren't that intuitive. I would like to run the complete Tamagawajosui sometime in late January. Somebody aiming for Tokyo-marathon who wants to join?